Welcome to the award-winning Healthwalks scheme! There are 18 regular walks across the city and lengths range from under a mile (average walking time: 20 to 30 minutes) up to three miles (average walking time one and a half to two hours). They are all free, led by trained Volunteer Walk Leaders and are also accessible by public transport. Research suggests that walking is possibly the single most effective and accessible form of physical activity and health professionals now recommend that everyone should aim to do 30 minutes of moderate exercise (such as walking) at least five times a week. Because walking is such an accessible form of exercise it is particularly beneficial to those who are getting little or no exercise, recovering from illness or lacking in confidence. Many of the walks are also wheelchair and buggy-friendly. Healthwalks programme: Download our current programme or regular and special walks and events. Being a Volunteer Healthwalk Leader: How you can volunteer with the scheme & information on our free training day. What is a healthwalk? Find out what makes a Healthwalk special. Why Healthwalks are good for you! The wonderful health benefits of walking. 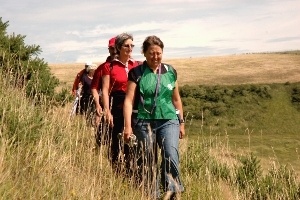 WalkWell: Our new scheme which provides 1:1 mentored Healthwalks for people affected by cancer. Based at the Horizon Centre. Healthwalks for Women: Times and locations of our women-only walks. Walking in the city: More information on how to get around Brighton & Hove on foot. In the last 15 years we have helped thousands of local people improve their physical and mental health and find out more about the wonderful places to walk in Brighton & Hove. Healthwalks are a great way to be more active, get out in the fresh air and make new friends. They are friendly, supportive and ideal for those who want to start exercising in a gentle and safe way, as well as those who want to walk regularly but don't have the time to attend longer walks. Healthwalkers have walked over 250,000 miles in that time - the equivalent of walking to the moon and back!